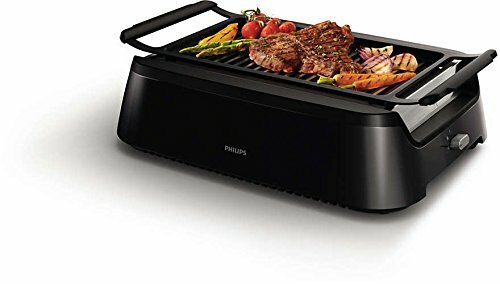 Add perfect grill marks hassle-free with the concentrated heat and low smoke of the philips indoor grill. Focused mirrors direct heat upwards to the grill surface and away from the drip tray, creating a 425-degree grill top while keeping meat and vegetable drippings much cooler. This setup allows for professional grill marks at a moment's notice-no need to brave the outdoors prepping and cleaning a full-size barbecue. 1660-watt heating element heats grill to 400 degrees in under 5 minutes. Lower drip tray stays at a cool 200 degrees to reduce smoking. Grill grate and drip tray are dishwasher-safe.